Last week I had the opportunity to watch a new user start out with GamePlan. This is always a valuable learning experience. He did well creating a plan, adding tasks, meetings and milestones, and assigning people to them. And then he got stuck. He created a group but couldn’t figure out how to add tasks to the group. He kept trying to drag the group onto tasks. It took about 30 seconds until he figured out that he needed to drag the task into the group. 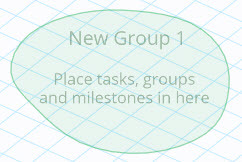 This amount of time is unacceptable, so we implemented the following change: an empty group now contains instructions on how to add items to the group. He then started linking items. And he got stuck again. He kept trying to link from a task to a meeting. We had disallowed linking to meetings because meetings take place at a specified time and they are not dependent on what comes before them. I watched the user get frustrated that he couldn’t link a task to a meeting. He even deleted the meeting and recreated it, assuming GamePlan wasn’t working correctly. 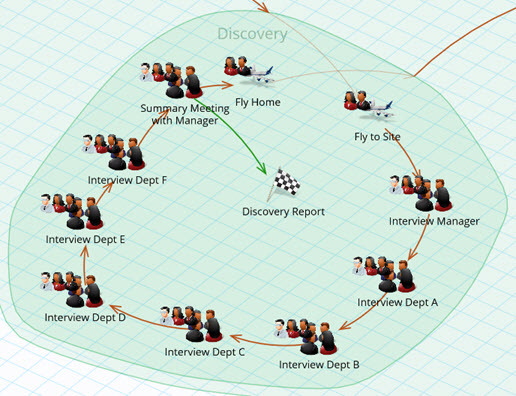 He wanted to link to the meeting so that it formed part of his project workflow. This is valid because the Whiteboard is all about communicating the project workflow. So you can now link to meetings. 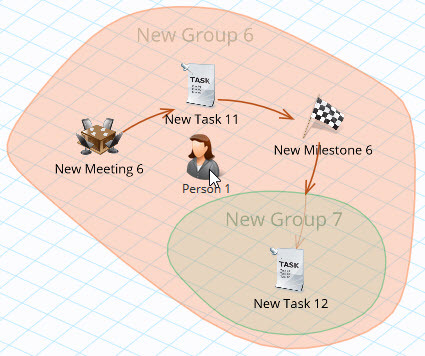 His last pain point came when he wanted to add the same people to a number of tasks within the group shown in the image below. This took 28 drag and drop operations! Not acceptable. We have now added the ability to drag a person onto a group, and that person will be assigned to all tasks and meetings within the group. If you run into a similar user experience where you think “I wish GamePlan could do that”, please let us know. Our existing users come first, so if you identify something that would make your life easier, let us know and we’ll see what we can do. Our new Forums site at https://forums.gameplan.global/ contains a Forum where you can submit development requests and view requests made by other users. Please use it! I like this! Not many software designers are so responsive to their customer base, though all should be. The forum sounds like a great resource.